The Panerai Luminor is an iconic timepiece in the watch world. Thanks to its crown-protecting bridge, it's become one of the most distinctive wristwatches worldwide. Special models are incredibly rare and coveted, making them wonderful investments. If you want to add one of the most popular watches to your collection, then consider purchasing a Panerai Luminor . This 44-mm luxury watch is considered one of the most famous men's watches of the past few decades. Its most distinctive feature is its crown-protecting bridge, which makes the watch waterproof by pressing the crown tightly onto the case. The American actor Sylvester Stallone greatly contributed to the popularity and prestige of both the brand and individual watch. Stallone purchased a Luminor while shooting Daylight (1996) and wore it in the film. He was so impressed by the timepiece that he created a limited edition version with Panerai: The Luminor Daylight Slytech (5218-207A). Today, the watch is so rare and sought after that it can go for prices up to and over 30,000 euros. This rare collector's piece has a small seconds at nine o'clock, making it a part of the Luminor Marina collection. The standard Luminor only uses two hands to tell the time: an hour and minute hand. These former military watches were named after the luminous material used, which is based on tritium. Officine Panerai, the company's official name, patented the material in 1949. Prior to that, radium was used because it was incredibly bright at night. The Radiomir was named after its luminous material as well. The first Luminor watches were released in the early 1950s and used as service watches by elite combat divers in the Italian Marines. 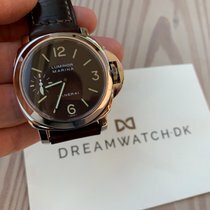 How much does a Panerai Luminor cost? Prices for a Panerai Luminor range from 3,400 euros for a Base version and around 17,000 euros for an 18-karat gold Marina. If you're looking for a model that truly represents the Luminor collection, then you should purchase the timepiece with reference number PAM00112. This Base model, the Panerai 112, has a 44-mm stainless steel case and, of course, features the distinctive crown-protecting bridge. The dial has the brand-typical Arabic numerals at three, six, nine, and 12 o'clock, with long stick indices serving as the other hour markers. The so-called "sandwich dial" on this Luminor Base is made up of two discs resting against each other. The top disc has cut-outs for the hour markers to make the luminous material on the bottom disc visible. The caliber OP X, a modified ETA Unitas 6497-A2, powers the timepiece, and has a 56-hour power reserve. A pre-owned Luminor 112 starts at around 3,500 euros; new, prices start at 4,500 euros. If the black dial is unappealing, a version with a white dial is also available. The model with reference number (PAM00630) features Arabic numerals as hour markers as well as a Panerai logo on the lower half of the dial. Stick indices are utilized as minute markers, making it easier to read the time. You can purchase this watch new for around 3,500 euros. Versions with reference number PAM00561 also have a white dial, but are powered by the in-house caliber P.5000 with an 8-day power reserve. The inscription "8 DAYS" is located above six o'clock instead of the Panerai logo. The price for a new model starts around 4,300 euros. The in-house caliber P.5000 is also used in Luminor watches with a brown (PAM00562) or black (PAM00560) sandwich dial. You can purchase the black version for around 4,500 euros and the brown version for 300 euros more. One distinctive feature of the Panerai Luminor Marina is the small seconds at nine o'clock. Versions with the automatic caliber OP III have an additional date display at three o'clock. The automatic watches have a 44-mm case, which is characteristic for the Luminor, or a smaller, unisex 40-mm case. The 40-mm version (PAM00048) costs 5,000 euros new and 4,000 euros pre-owned. The prices for pre-owned 44-mm versions (PAM00104) start at around 4,200 euros, and new, they also cost 5,000 euros. If you prefer a manual Luminor Marina, then you should look at the timepiece with reference number PAM00111. This model is powered by the caliber OP XI, which is based on the ETA Unitas 6497-A2. Since this movement features a small seconds with a stop-seconds, it's also chronometer certified. 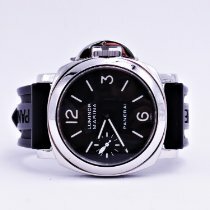 You can purchase a Panerai 111 for 4,000 euros pre-owned and 5,200 euros new. If you already own many Panerai watches and want to add another gold Luminor to your collection, the PAM00511 is perfect for you. This Luminor Marina is made of 18-karat red gold and has a power reserve lasting eight days thanks to its powerful, in-house P.5000 caliber. This gold watch costs around 15,000 euros. Unlike most Luminor models, the Submersible timepieces feature a rotatable bezel for measuring your dive time. The watch's name gives you a hint as to its purpose and seeing as it's waterproof to 300 m (30 bar), it's more than ready for a dive trip. Due to the build of its automatic caliber, which is based on the Valjoux 7750, it features a small seconds at nine o'clock and a date display at three o'clock. You can purchase a pre-owned Luminor Submersible for around 4,200 euros and a new one for around 5,700 euros. If you're traveling often, you probably need to keep an eye on the time in a few different time zones. GMT watches are the ideal tool for that. Aside from local time, they display the time in a second time zone. One such watch is the Luminor GMT Automatic, which displays a second time zone with the help of a fourth hand and a 24-hour scale. The automatic caliber OP VIII with small seconds and a date display powers the PAM00088. Pre-owned models cost around 4,000 euros, while new they cost around 5,700 euros. If you're a fan of Luminor designs but prefer a retro look, then consider the Luminor 1950 series. The cases of these timepieces are reminiscent of watches from the 1950s. They're easily distinguishable by the presence of the engraving, "REG. T.M.," on the top of the crown protection. The other Luminor collections do not have this feature. The 1950 series also has more defined curves than its flatter siblings. You can purchase a Luminor Marina 1950 (PAM00312) for as little as 4,500 euros. Prices for new models start at around 5,600 euros. The Panerai 312 is powered by the in-house caliber P.9000, which features a power reserve lasting 72 hours. The automatic movement also has a date display and small seconds. The Luminor 1950 8 Days GMT is also powered by an in-house movement. This watch (PAM00233) is powered by the caliber P.2002 with a GMT function, 24-hour display, small seconds, date display, and linear power reserve display. Once the movement is fully wound, it runs for 192 hours. You can purchase a pre-owned Panerai 233 for around 8,000 euros and new, it costs 8,500 euros.